Original reservation prices will be used. Contact Funky Monkey Hostel for questions. No cancellations. All reservations must be paid in advance. Funky Monkey Hostel was designed with our guests in mind. With a combined 17 years of traveling, living & backpacking in 24 countries around the world, its easy for the owner to know what you want. Highest quality available Pillow Top mattresses, considered by many to be their best sleep in months. The rooftop terrace with hammocks is perfect for sunsets, chilling in one of the hammocks or the swinging day bed, and the rooftop fire pit is great for after dark drinks and stories from world travelers & backpackers. 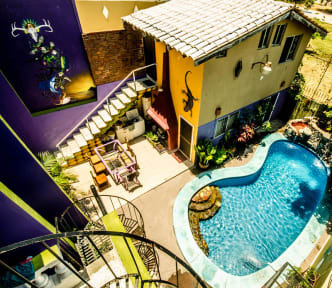 The swimming pool, with it's waterfall & lounge chairs, is a perfect solution for almost any reason you can think of; plus it has an amazing hammock hanging on the waterfall that greatly helps with Margarita Time. With two communal kitchens, you can stay-in and cook your favorite meals from home, if you've been traveling for months. Equipped with two living rooms or common rooms, a large selection of board games (23), Netflix or other on-line movies, it's easy to take a night off and stay in. Located in the Golden Zone, which offers 2 large grocery stores, numerous sea food, taco stalls and other spectacular restaurants. All the night clubs are within walking distance but far enough away that you won't hear a sound from them when at the hostel. We are only 7 blocks from the best beaches Mazatlan offers for swimming and surfing. 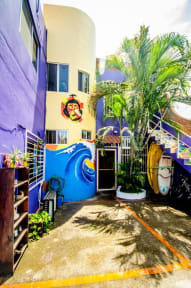 Funky Monkey Hostel is the best choice for amazing value and if you like to meet and make friends with people from all over the world, this is the place. We offer 2 private rooms (sleeps 1-3 or 2-5 guest) with their own kitchen, bathrooms and air conditioning for hot nights. We also have 4 small dorm rooms sleeping 4,5,6 or 8 people, all with comfortable beds and pillows. If your arrival is after 23.00 PM you will need to contact the hostel and let us know. We charge a fee of 100 pesos for check ins after 23:00 PM, as we need to have a staff member waiting up outside working hours. Anyway, you can hangout and wait for your bus, ferry or airplane if needed. Please check with our managers. This hostel is certainly a highlight! It is worth every penny. Location is excellent, price is fair and staff is helpful. It's got a pretty nice decoration and an amazing atmosphere. One of the best hostels I've ever been at. Highly recommendable! My husband Josh and I had an unforgettable stay at Funky Monkey Hostel. We were greeted immediately upon arrival with a big smile and a welcome from every single staff member. The hostel is situated in an incredibly safe area in the Golden Zone, just a short walk to the beautiful beaches. The best part of our stay was talking to the owner Salem and his employees. We felt like we had been invited to a family's home, and they made us feel so welcomed. We would definitely recommend it! Great staff, comfortable vibes, great location (ten minute walk from the beach), gate in the front only accessible with a key, complimentary breakfast and coffee! Would come to stay again. Extremely casual and confortavke place, not a party hostel but something in the middle and cozy. Location could be better, but not much else. A decent hostel. Lots of long time guests and staff working there who try to organise events for people to do as well. The staff was very helpfull; all volunteers so easy going philosophy. The sheets were not smelling fresh. If you are looking for authentic streets and fresh food, leave the zona dorada and go to the old town.